Wash and trim eggplant. Do not peel. Quarter and remove seeds. Cut into 1-inch cubes. Eggplant should yield about 3 cups. Wash and trim zucchini. Cut into 1-inch cubes. You should have about 1 cup. Heat olive oil in a large pot. Add garlic, onion, and eggplant. Saute until eggplant begins to soften, about five minutes. 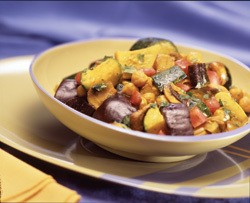 Add zucchini, ginger, curry powder, mushrooms, and diced tomato. Cook for two minutes. Add chickpeas and coconut milk. Cook on medium heat until all ingredients are heated through. Serve with hot rice and garnish with fresh chopped cilantro.